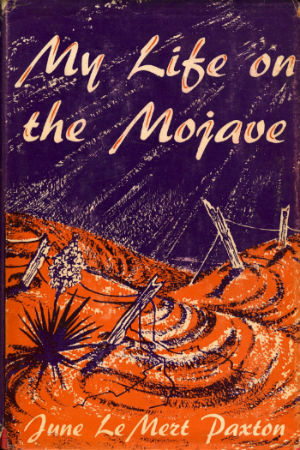 Finished reading My Life on the Mojave, by June Le Mert Paxton. It had some hair raising sections in it, and lots of lacy poetry. It touched on the Great Depression, and depression. She never really spoke of her ailments but hinted at asthma and depression. She'd visit her husband and daughters in Pasadena from time to time and they drove to the desert to visit her every other week. The healing aspects of the deserts are highlighted, as they were in the book Sand in my shoe, homestead days in Twentynine Palms, by Helen Bagley. Both books talk about all the people who came here to regain their health, starting with veterans from World War I. Many people who were given only a few months to live were able to fashion a life for themselves and hang on another 10 or 20 years or more. Le Mert writes about life and death, wildlife, shotguns, small luxuries, and local families whose names I still see around. Beside the poems the book also included many optimistic letters to her friends and daughters. I also finished Deathwatch, by Robb White for Kip's Desert Book Club tonight. It's a grueling account of desert survival, kind of 127 Hours (without the removal of body parts) meets True Blood (without the vampires). The protagonist reminded me of True Blood's small town Jason Stackhouse, capable but uncomplicated, longing for a world that makes sense, and getting in trouble because he lives as if it does. This is my first visit to the book club, and I'm looking forward to going and already bought a bottle of thrifty champagne for Kip's birthday.